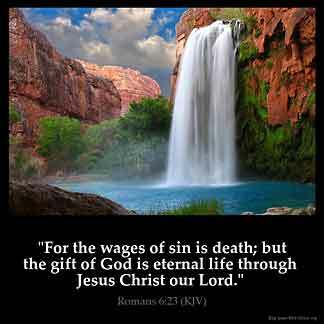 ROMANS 6:23 KJV "For the wages of sin [is] death; but the gift of God [is] eternal life through Jesus Christ our Lord." 20For when ye were the servants of sin, ye were free from righteousness. 21What fruit had ye then in those things whereof ye are now ashamed? for the end of those things is death. 22But now being made free from sin, and become servants to God, ye have your fruit unto holiness, and the end everlasting life. 23For the wages of sin is death; but the gift of God is eternal life through Jesus Christ our Lord. For the wages of sinne is death: but the gift of God is eternall life, through Iesus Christ our Lord. For the wages of sin is death; but the free gift of God is eternal life in Christ Jesus our Lord. For the reward of sin is death; but what God freely gives is eternal life in Jesus Christ our Lord. For the wages of sin [is] death; but the act of favour of God, eternal life in Christ Jesus our Lord. For the wages of sin is death: but the gift of God is eternal life, through Jesus Christ our Lord. For the wages paid by Sin are death; but God's free gift is the Life of the Ages bestowed upon us in Christ Jesus our Lord. for the wages of the sin [is] death, and the gift of God [is] life age-during in Christ Jesus our Lord. 6:23 Death - Temporal, spiritual, and eternal. Is the due wages of sin; but eternal life is the gift of God - The difference is remarkable. Evil works merit the reward they receive: good works do not. The former demand wages: the latter accept a free gift. Ro 6:23 The wages of sin [is] death, one of the saddest, but profoundest truths of the world. Sin is a master of his servant and pays wages. But the gift of God [is] eternal life. God gives to those who turn from sin, life eternal. It is his gracious gift, conditioned on refusing to be the servant of sin longer, and is "through Jesus Christ our Lord". Oh what a wonderful God to serve, to free us when we don 't deserve. I like the two extremes in this verse. Wages And death Gift and life, it says it all.